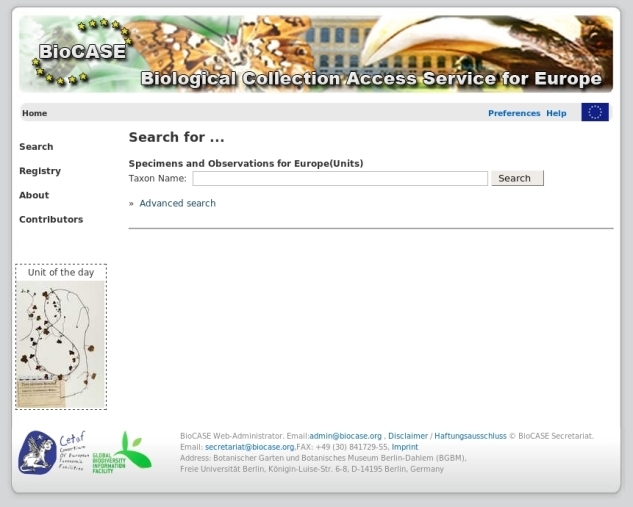 The BioCASe UI is a search portal that can be used to query European ABCD and Darwincore providers. It has been developed within the Synthesys European project, as a new portal to access European data. The portal is based on the prior work done by the BioCASe interface project. You can also try this portal. A "simple search" allows you to perform a search based on scientific names. An "advanced search" allows you to perform a search based on scientific names, common names, collector names, or family names. It also enables you to restrict your search by choosing institutions, collections, countries, localities and multimedia contents. Get the portal sources from our svn repository. Rename the folder (choose your own name for the portal) and move it to your favourite directory on the web server. Open a command prompt and go to the directory where you just placed the sources. On Linux/Mac run "python setup.py", on Windows "<PythonPath>python.exe setup.py". Answer each question of the setup script to set the different parameters; you will be able to change/correct them later in the configuration files if needed. The script will check for the required packages and direct you to the pages you can get them in case they're not installed. After the script is completed, update your web server's configuration file with the configuration lines given by the script and restart your server. Test your installation (URL will be displayed at the end of the configuration script). webapp/configfile.cfg - Cherrypy and general application settings; you should not change anything except the URLs of the XSLTs. config/admin.ini - specifies if the portal is for taxonomists or not and what sort of DBMS you're using (MS SQL Server or MySQL). config/config.ini - Mail server properties, the portal's name and location, location for thesaurus configuration files. references.xml - List of thesauri with their official names, displayed names and displayed references. The boolean "reference display='True'" specifies if the thesaurus should be used for this portal installation. relations.xml - List of relations known to the different thesauri. thesaurusList.xml - List of available thesauri for the taxonomist's portal version; type=name of the thesaurus (must match the configuration file name in TOQE) and the TOQE URL to access the service. thesaurusListSimple.xml - List of available thesauri for the simple version (author names and concepts will not be displayed); type=name of the thesaurus (must match the configuration's file name in TOQE) and the TOQE URL to access the service. #The values of PythonInterpreter don't really matter, as long as they're different between the two Location blocks. It has been tested on Windows XP Professional (SP 2), Debian 3.1 , and Ubuntu 6.06 LTS-8.10. As client browsers, Internet Explorer, Mozilla Firefox, Opera and Safari have been found OK.